I was invited to a friends' housewarming this weekend, and I had the idea of potting up one of my plants in a nice pot and giving it to them as a housewarming present. Luckily I already had a suitable pot of the right size in the shed. 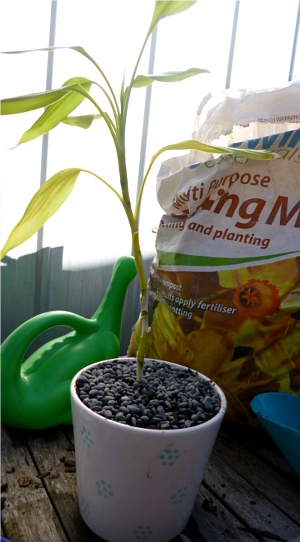 The bamboo plant is a cutting from another plant which I had been given by a co-worker. 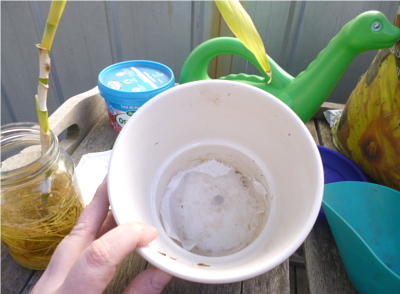 I like to use coffee filter paper to line pots, to stop the soil from coming out the bottom. It's quite strong and very affordable from Daiso or the supermarket. I probably should have potted this cutting some time ago, oops! 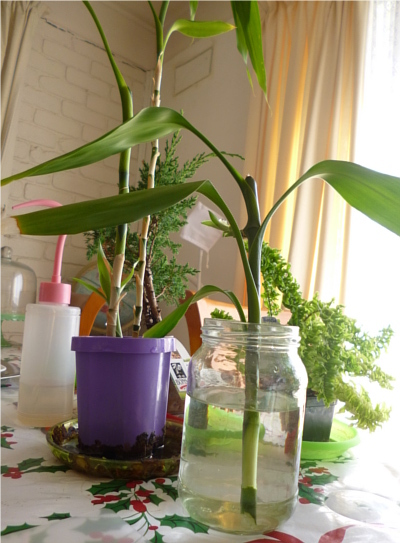 The roots have become quite long and grown in a spiral following the shape of the jar it was in. Now it will be a bit more free to grow. 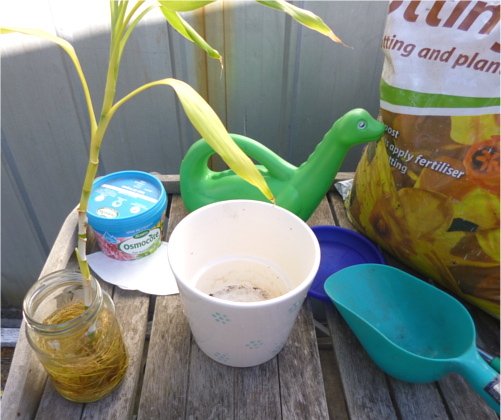 After potting, water in well. 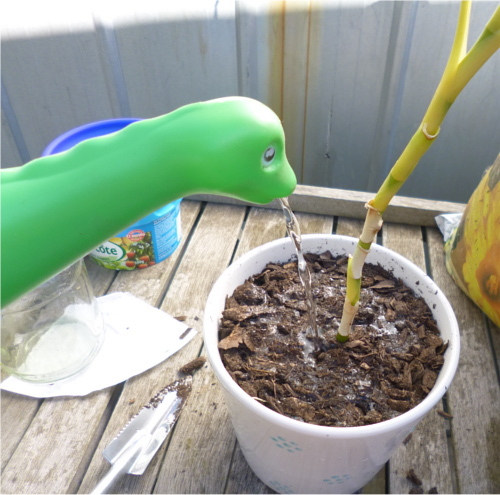 Using a cute watering can if you have one! I added some decorative rocks to cover the soil. Hopefully this baby will grow well in its new home. 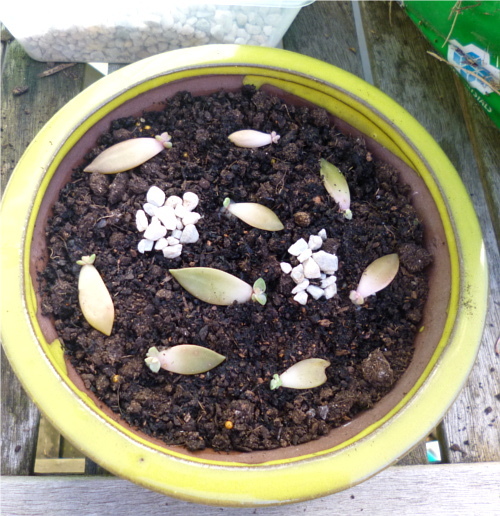 I was in the zone, as they say, following that, so I potted up some succulents I'm growing from dropped leaves. 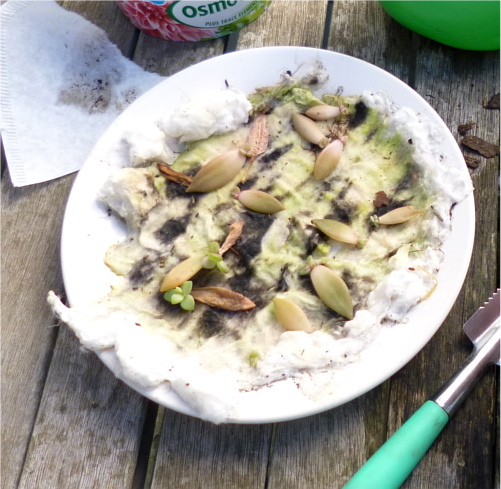 The cotton wool developed algae and started looking manky after I left them outside for a couple of days. Yuck! Time to do something about it! All of the babies come from one plant which I named Doris. I did have Doris at work, and had to take all my plants home when I finished up my job. Doris is quite fragile so I was as careful as I could be, but about 12 leaves fell off. I put them on cotton wool in case they grew, but I wasn't expecting so many of them to catch on! I put the 3 largest ones into this cute pot from Daiso. I planted the rest into this spare bonsai pot. I seem to have a lot of bonsai pots of different sizes lying around. There's a bonsai nursery not far from my house, and about once every six months I go there and admire all the beautiful old trees, and get some supplies. Perhaps I should just give in and admit that I'm a pot hoarder collector. I've been using them in the bedroom as containers to store beauty products in as well. 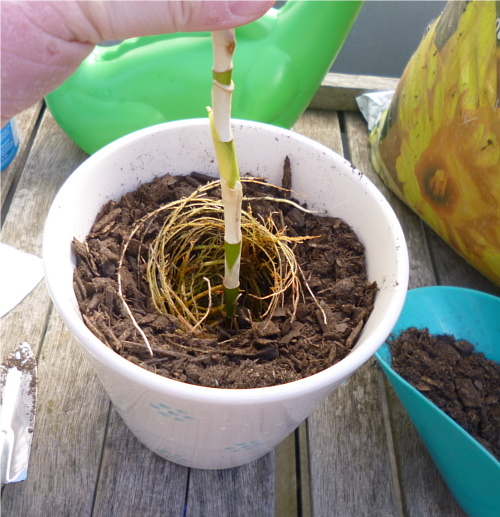 When I went back inside, I took a new cutting from Lucky Bamboo which will hopefully grow into another plant I can give away. A few weeks ago my friend and her 3-year-old daughter came to visit, and as they left, I let her choose a plant to take home with her. It was such a lovely experience seeing my little friend get excited about her plant. Doing things with plants is one of my favourite activities, and I've realised that I really enjoy giving them away to people as well. It's not an excuse to collect more pots, really it's not! Thanks! 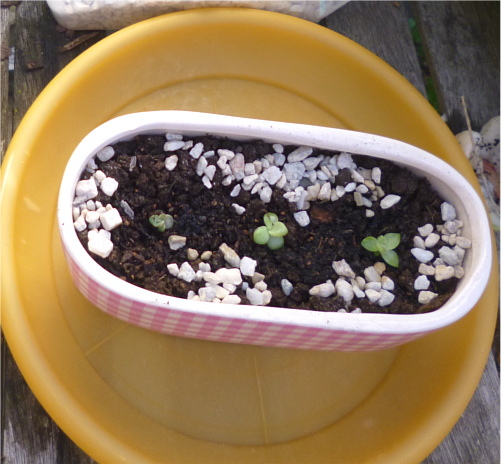 Succulents are pretty easy to grow, just lay the leaves on top of the soil and keep it moist. I know what you mean about it becoming addictive! I can't wait until they've grown a little bigger and I can put them in pots of their own.